211 Bernard: Tonight at 7:00 p.m. - Poetry Launch with Phoebe Wang and Suzannah Showler! Tonight at 7:00 p.m. - Poetry Launch with Phoebe Wang and Suzannah Showler! 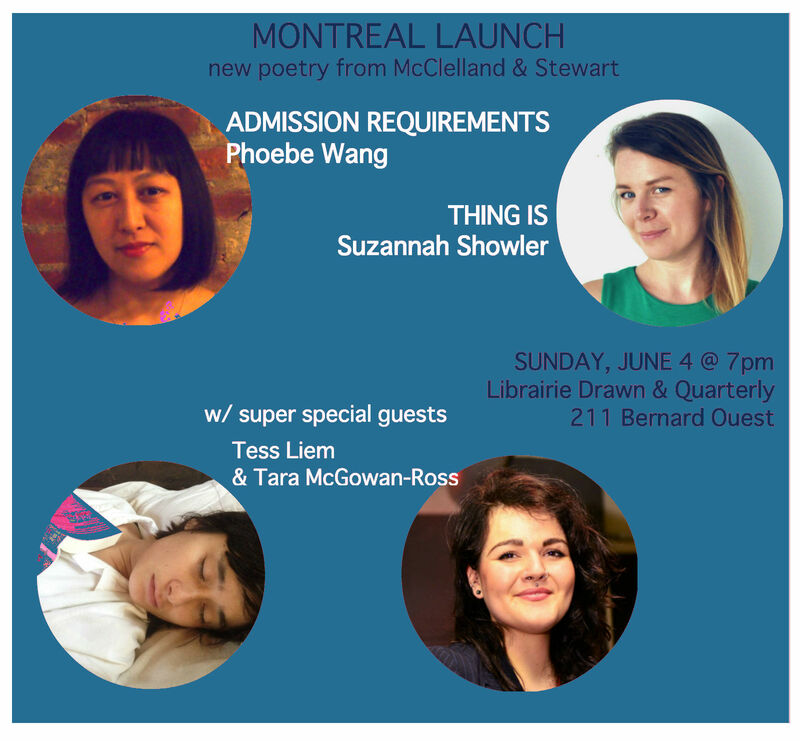 Join us for the launch of not one, but two new books of poetry from McClelland & Stewart on Sunday, June 4th at 7:00 pm! Phoebe Wang will be launching Admission Requirements, and Suzannah Showler will be launching Thing Is. The event will feature readings by the authors along with local poets Tess Liem and Tara McGowan-Ross. PHOEBE WANG is a poet and educator based in Toronto. Her debut collection of poetry, Admission Requirements, appeared with McClelland and Stewart in Spring 2017. She is the author of two chapbooks and her work has appeared in Arc Poetry, The Globe and Mail, Maisonneuve, Ricepaper Magazine, and THIS Magazine. She has been twice been a finalist for the CBC Poetry Prize and won the 2015 Prism International Poetry contest. She currently works at Seneca and this spring was a co-coordinator for 'Fuel for Fire', a professional development event for writers of colour in partnership with the Ontario Arts Council. SUZANNAH SHOWLER is the author of the poetry collections Thing Is (McClelland & Stewart, 2017) and Failure to Thrive (ECW, 2014). Her writing has appeared places like Slate, Buzzfeed, The Walrus, and Hazlitt. Most Dramatic Ever, a book of cultural criticism about The Bachelor, is forthcoming Spring 2018. A 2017-2018 Presidential Fellow at The Ohio State University, she is currently looking for a place to live in Canada.